We had the great pleasure of Robert Darling from Washington D.C. attending this show. Robert is an ADS accredited judge and a notable photographer. He is also a very welcome guest to our NCDS spring and fall daffodil events! 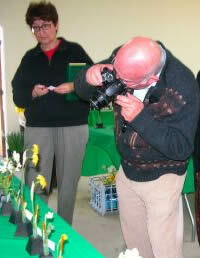 At this show, Robert was a member of both the photography and the miniature daffodil judging teams. Yes, we kept Robert busy! Below is Robert’s write-up about this show, specifically his observations about Marilynn Howe and Harold Koopowitz’s miniature daffodil breeding program. Enjoy! One knows to expect the unusual from the Northern California Livermore Show. This year exceeded expectations with a large display, astounding in unexpected variety, and covering ALL divisions. I’ve never attended a show that accomplished this feat including two Division 9’s, (Weston 12 & Wilson Sdl.) and four or five Division 11a, plus a number of Division 2s, Division 8s and more. In addition to the four large growers there were a satisfying number of small growers represented on the miniature bench. The achievements of Harold Koopowitz and Marilyn Howe drive expectations along with the brave experiments of Bob Spotts and make one long to see their flowers grown more widely. This Div 2 W-WPP 03-022 Pink China x Sprite wants to be a pink trumpet, but makes for a lovely pink division 2. Also in the pinks were a number of Pink China x N. dubius crosses, a few seen before, that seem to only get better over time. This cross, uses one of those flowers used by Roberta Watrous, Little Ruby x N. dubius to achieve a light pink tazetta. This one featuring a beautiful rose pink showing little peach. 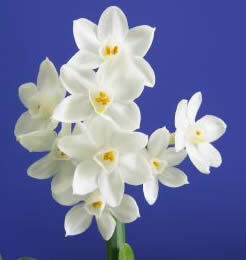 Other tazettas of special note included several paperwhite x N dubius and a (Paperwhite x pachybolbos) x o.p. shown here: The numerous individual florets are 1/2″ or less and well spaced. I trust that Kirby or Harold will post some of these and other excellent small tazettas that greatly expand the choices available to the miniature exhibitor and gardener. Harold included 5 different tazetta crosses in the show, 8 W-P, 8 W-W, all valuable additions to the miniature class. There’s many more to show For this post we’ll leave with Harold Koopowitz, urged on by Nancy Tackett w/ judging ballot, photographing a few of the 12+ candidates for the miniature Rose Ribbon! What an event, a miniature tomorrow spread out before us to wonder upon. In the center note a m11a y-y and the small white a repeat of Grey’s Raindrop/Icicle crosses: N. triandrus x N. dubius and N. dubius x N. triandrus. But we’ll save those for another post. Ron Scamp and Elise Havens, with their wonderful new splits provide excellent examplars of a what a beautiful division 11 daffodil might look like. 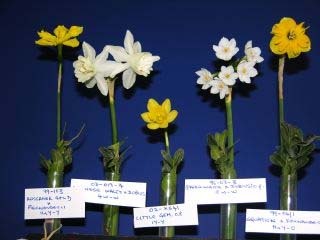 Harold Koopowitrz, downsizing splits to the proportions of a miniature daffodil, achieves interesting results using N. henrequisii, N. willcommenii and others and hints at a beautiful division 11 miniature. The flowers in his crosses coming 1 – 2 or perhaps more to a stem vary in their beauty, if not in interest. All present a definite miniature flower, about the size of Segovia on a good day. Single flowers look in balance in a collection. Those with more florets might overpower a small miniature collection of 5, 9 or 12 stems and wants careful use. 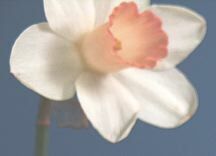 But, all show great charm and promise in a miniature division that for years had no splits at all. Bracketing this collection the first, despite the pose, alas that changed overnight, is Koopowitz 99-103 Rossanor Gold x N. fernandesii, with its head in the air and 99-54/1 Equation x N. fernandesii. There were others to admire as well. An example of the Equation x N. Fernandesii cross with two florets. There were many blooms from this cross including a lovely vase of three. I’ll admit to several attempts at a split that we hope germinates now. I suspect that there are others in the pipline and look forward to seeing them in the very near future when Division 11 will be well represented in the miniature class. A direction noted for some years, to downsize miniatures to ever smaller flowers, now bears results. 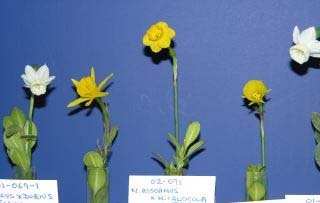 This collection, exhibited by Marilynn Howe at the Livermore NCDS show, presents a wonderful example of very small flowers. Contrast them with the typical boxwood wedging material.All of these flowers are in scale, even if the staging blocks are designed for regular sized miniatures and in this collection appear too far apart. Mini miniatures would look better a bit closer together. The blooms are less than 1/4″ and very, very ice white. (the photo makes the corona seem cream – it is not) These are a first year bloom. One can hope it will evolve as a strong plant with more than one floret. The center bloom in the above collection, N. assoanus x N. cacicola 02-071 while labeled a 7 y-y might equally be considered a division 2 if it continues to bloom with only one floret. The very tiny bloom looks like a small 2, or perhaps a 3, although the very small cup probably measures as a division 2. The cup as shown does look gold or orange. 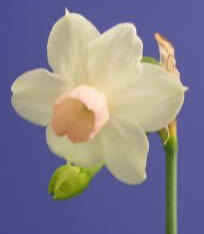 The other flowers all balance in size and are all at or under 1/2″ in diameter. I would not like to try to balance them against some of the other basic miniatures. Segovia and Xit, let alone Little Rusky, would all overwhelm these tiny flowers in a balanced collection. Also shown in Livermore were other micro blooms. The Little Gem o.p. 02-x541 Koopowitz example shows a wonderful balanced extremely small trumpet. In size, think of something between a bit larger than a dime, (note the boxwood foliage) much smaller than Little Gem! The hooded perianth, while typical, responds to grooming. The fine serration looks well on the small trumpet and the perianth segments, while not the widest are in balance with the trumpet. If it keeps this size, to my eye it is the smallest trumpet I’ve seen. 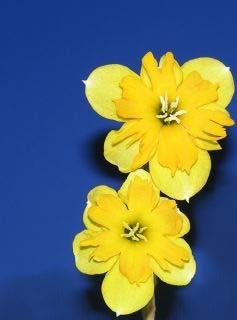 Also readily seen on many show tables are very tiny division 6 flowers, Cupid and Heidi come to mind. Ferdie as shown in Livermore also presented an extremely small flower. We can think of several others the Tasmanian Little Becky’s & Emma for example. We’ve also seen many species and hybrid bulbocodium and several hybrids that also fit this smallest of the small category. Two divisions 10s are in the above collection. Even some of the Division 8s with small florets might fit such a display. This cross, N. cupularis o.p.x Koopowitz 02-x49 with its prominent mucro points, from Harold’s winning Watrous collection, has florets of 20 cm or less and gives a very dainty appearance. The many florets of a N. willcommenii would also be in scale in such a collection. So, just as the ADS agonized about creating a category for Intermediates, we now might start to conceive of dividing the miniature class, admitting another range of ever smaller flowers to draw the proverbial ohhs and ahs from the public and ourselves. 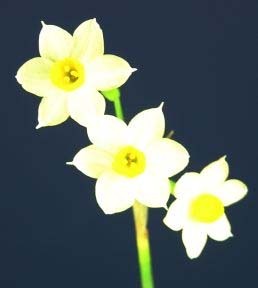 We may not have hands small enough to stage them well, and our properties chairpersons may despair of making blocks to show them to advantage, but, as the NCDS show confirmed, we’re ever on the way toward really downsizing the daffodil into a diminutive delight. Do we want such a class?